Dynamic AFM with extremely small oscillation amplitudes of the probing tip enables Atomic Force Microscopy with atomic and even sub-atomic resolution. By adjusting the oscillation amplitude to the regime of short-range forces the impact of long-range forces on the detection mechanism can be suppressed effectively. For stable operation the bending forces of the cantilever must be able to overcome the attractive tip-sample forces. Dynamic AFM with sub-nanometre amplitudes requires cantilevers with a force constant larger than 300N/m. The force constants of typical AFM probes for intermittent contact (Tapping Mode) are in the order of a few tens of N/m. Therefore, amplitudes of at least a few nanometres are required for stable operation. 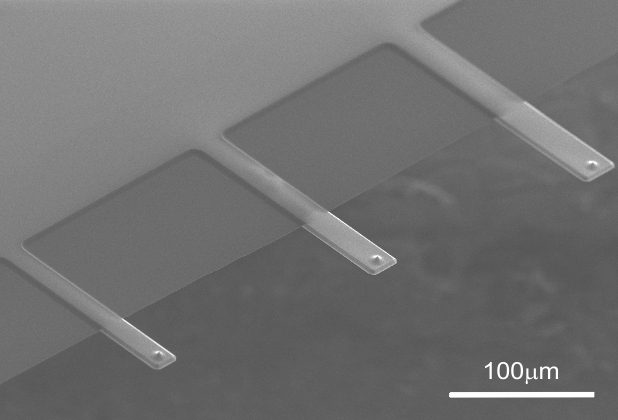 Ultrastiff AFM cantilever probes with integrated sharp tips have been fabricated based on the well-established NANOSENSORS™ PointProbePlus® process. Cantilever geometries of 100µm length and 7 or even 10µm thickness have been realized resulting in force constants of 600 and 2000 N/m.